Asian Trout with 5-spice seasoning and toasted sesame seeds. The Red Minnow is a hidden gem in Central, SC. Seriously, it’s almost out of sight from the road because it sits down in a little depressed piece of property with trees protecting the perimeter. It is a little old house that has been converted into a quaint supper club. From the outside décor to the inside décor, the feeling you get is rustic. Exposed beams, stone walk ways and fur pelts adorn the walls. I liked it immediately. I hate hunting, but something on my Dude DNA really lights up when I see a place that has taken interior design tips from Daniel Boone. Trout is the backbone of The Red Minnow menu. They prepare it 13 different ways and of the 4 ways I tried, all were successful. 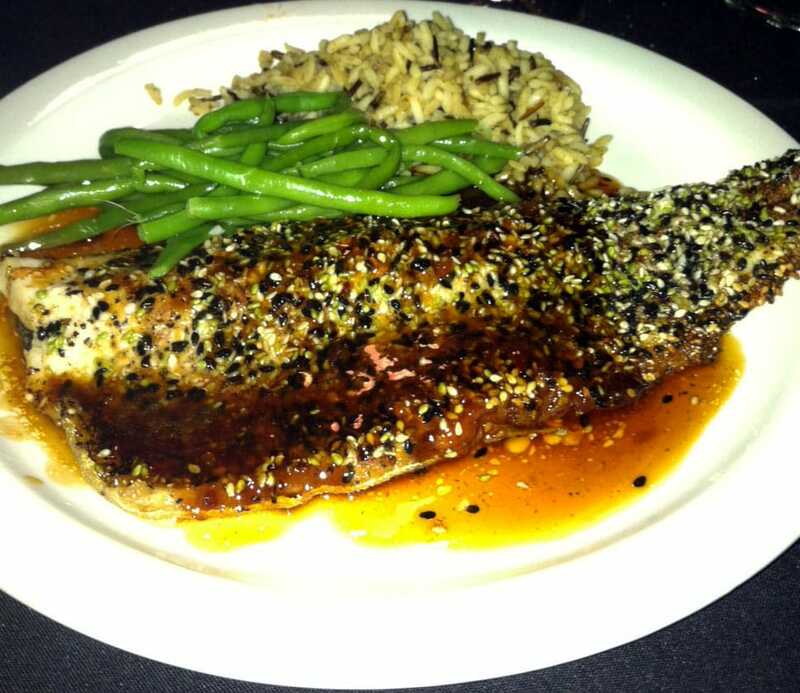 We tried the Asian Trout that was seasoned with 5-spice and toasted sesame seeds. Awesome. The Blackberry Jam Trout was incredible. I know it sounds breakfast-y, but the sweetness goes fantastic with the delicate fish. I ordered the Southern Trout, which was fried with a cornmeal batter and drizzled with jalapeno honey! Yep, it was money. And the simple Traditional Trout was just grilled with olive oil, salt and pepper. Simple is sometimes all you need. In addition to our trout, we had someone order the bacon wrapped filet and the Chef’s Special: Eggplant Napoleon. I did not try the steak but it looked spot on, and the eggplant was amazing. 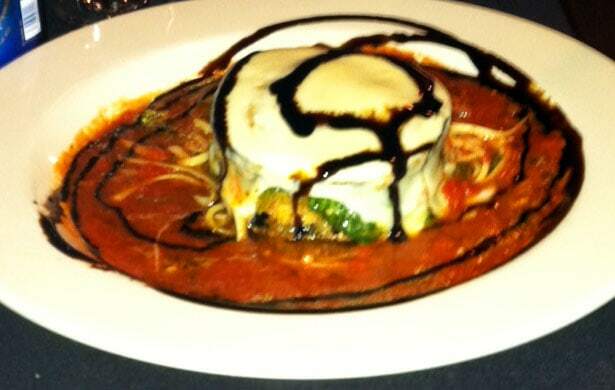 It was stacked high and wide and oozing with melted cheese and a balsamic vinegar reduction. Their homemade marinara was well rounded with a hint of sweetness and red wine. When I return for my second visit, I will 100% try something with Italian flavors. The specials they had that night were tempting too, but I figured I’d order off the menu for my maiden voyage. Napoleon Eggplant with homemade marinara and drizzled with balsamic vinegar. We also got an appetizer of calamari that came with that delicious marinara. They have frog legs too. I wanted to try them because I haven’t had them since I was a child, and I found them to absolutely revolting then (I remember my grandfather inhaling them in front of me and I just thought about poor Kermit sitting in a wheelchair legless and unable to run away from Miss Piggy’s sexual advances). Dessert was almost the best part of the meal. It was a Coconut Lemon Curd Cake. Y’all, it was as rich as an oil tycoon and worth the extra time you’ll have to spend exercising (that is the gayest thing I have ever written). Trust me. Order it. I’ll repay you personally if you don’t like it (No, I will not. I am poor). 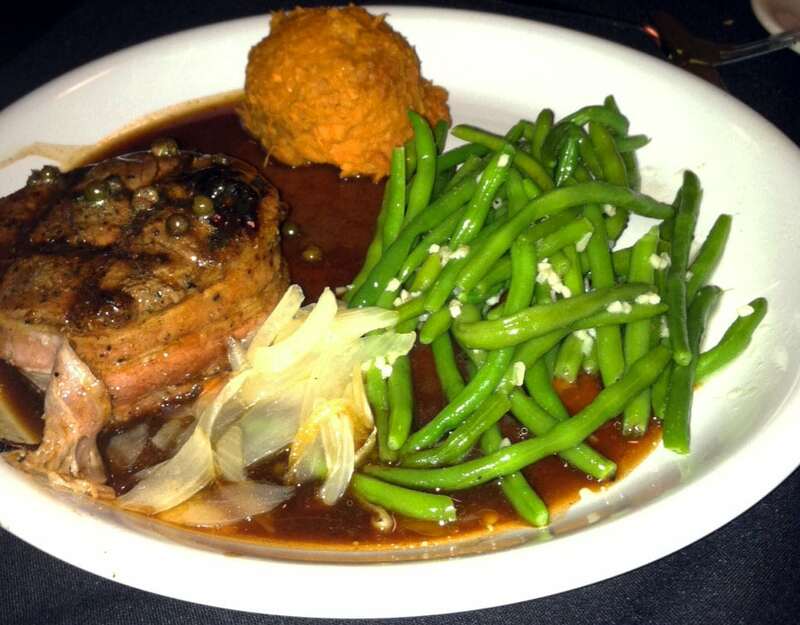 Bacon Wrapped Filet with sauteed leeks, beans and whipped sweet potatoes. The best part of the meal was when Chef Jeff came out to the table and talked with us. We all loved our meals and got to thank him personally for the time, dedication and love he put into his food. He informed us that the eggplant Napoleon actually won best appetizer a few years ago at a competition at the Grove Park Inn in Asheville. He was quite proud of it and informed us why his name is on the dish. It’s great to see pride shine through on someone’s face. A job well done should be enjoyed. I enjoyed his work. I enjoyed his staff and when you combined those things with good friends it makes for one helluva a good evening. Raise your glasses, here’s to The Red Minnow. Check it out people. Previous Post: « Did you work out yesterday?